For over 50 years Pfannenberg has been a leader in thermal management solutions. From simple Fan Cooling and Packaged Air Conditioners to more complex water cooled applications, our expertise helps ensure industrial electronics operate at peak efficiency and extended service life. Pfannenberg's Air/Water Heat Exchangers offer a solutions to fix your thermal management problems in washdown areas of the plant or areas with high amounts of particulate . The sealed cabinet provides contaminant-free component cooling without adding heat to the local environment. It provides an excellent economic solution where plant water is available or when used in conjunction with a process chiller. It's sealed design and available stainless steel, NEMA Type 4/4X construction provides a maintenance free solution with no exposed fans or maintenance of filters required. 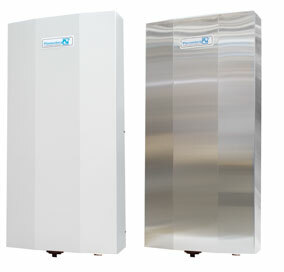 For applications which require local enclosure cooling using a remotely located source of refrigeration, PWS Series Air/Water Heat Exchangers provide the perfect solution. Paired with our CC or EB Series Chillers, the air/water heat exchanger provides a total cooling solution that manages process and/or control enclosure heat gain and effectively removes it from the processing area. Single source responsibility for the complete system ensures properly matched components that are engineered to work together - and to provide a custom fit to the most complex food processing equipment.